You Read Creation: What is 786 ? Value of 786 ! 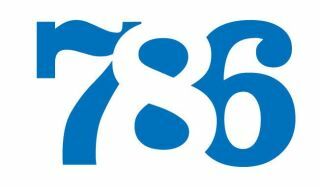 What is 786 ? Value of 786 ! Some peoples around the World believe that "786" is very important for Muslims.I know Most of the Muslims know the truth. In Movies, TV serials shows, those have "786" in anything,they get help from Allah during problems. Car No, Mobile No, Telephone No having "786" is sale in very high rate. with "786" at Cost around 1000 INR, or more. and those peoples are Muslim and NON-Muslims, Non-Muslims pays extra to get this numbers. So, What is the Importance of "786" in ISLAM. Some Muslims says "786" = ‘Bismillaah al-Rahmaan al-Raheem’. Is this really Important no? The innovation of writing "786" replacing ‘Bismillaah al-Rahmaan al-Raheem’ has been adopted for a long time and the minority of the Ummah is still indulged in it inadvertently. "786" don’t have any Value in Islam. as a True Muslims are Instructed to follow the words of Qur`an and teachings of prophet muhammad(s.a).and there is no discussion about 786 in Quran or in Hadith. Apart from the common folk, the scholars also heed no attention towards it and to avoid disrespect to the Holy Words they use it in their letters and documents. They adopt it as ‘correct’ and ‘better’ way to invite Allah’s blessings and have also started replacing the Holy Words by this number on their houses, offices, buildings, etc. Unfortunately, this tendency is gradually gaining momentum. But, do we see this number instead of the Holy Words in the Holy Qur’an? Or, can we write it there as well? can we remove ‘Bismillaah al-Rahmaan al-Raheem’ from the top of Surah al-Faatiha and replace it with the number 786? Obviously not. If we study the Qur’an, we see it carries the holy words in a letter from Prophet Solomon (pbuh) to the Queen of Sheeba – Bilqis – who was an infidel at that time. Even Prophet Muhammad (s.a) in his letters to different heads of states and governments, used the holy words at the top. Therefore, whosoever uses "786" with the intention to obtain Allah’s blessings, is a misguided person and any attempt to justify it, is ignorance. it is necessary to avoid using this number to avoid the danger of being indulging in infidelity. Islam’s foundation is laid on the belief in Tawheed (oneness of God). If we associate anyone with Allah’s exalted names orally or practically, we would be committing infidelity which is an unpardonable sin. The Qur’an warns us, one who finds a rival against Allah, Allah will never allow him to enter paradise, and his abode is the hell. The letters by the Prophet (pbuh) to non-Muslim Kings and chiefs bear the holy words ‘Bismillaah al-Rahmaan al-Raheem’. This was also the case of his noble companions. Did the Prophet (pbuh) and his companions respect the Holy Words less than we do? Was the verse, ‘Today I completed your religion for you’, revealed to the Prophet (pbuh) or to the so called scholars of our age who are all bent to amend the Divine principles. Some Muslims replace Allah’s name by the number ’66′ and the Prophet’s (pbuh) name by ’92′. But if one ask, the number ’420′ is used against somebody’s name and he is called ’420′. Can he bear such an insult? Calling someone by a nick name is a sin. Allah Ta’ala says, ‘Don’t call one another by nick names‘. If Allah prohibits the use of nicknames for fellow human beings, how can He allow the use of such insulting replacement number for Himself and His Prophet (pbuh). ‘Bismillaah al-Rahmaan al-Raheem’ great significance in the Qur’an and Muslims are ordered to begin any work but in the names Allah, not in the number of ’786′ or any other substitution.